After reading Michael Pollan’s Ominivore’s Dilemma in October 2007, I made a commitment to make a small change in what I ate. That change was beef. I would only eat grass fed beef from that point on. It’s getting close to three years now. I eat much less beef than I did before because its harder to find on menus and I have to buy and cook it myself. I was so excited when I heard that a new burger joint was opening that served grass fed beef. 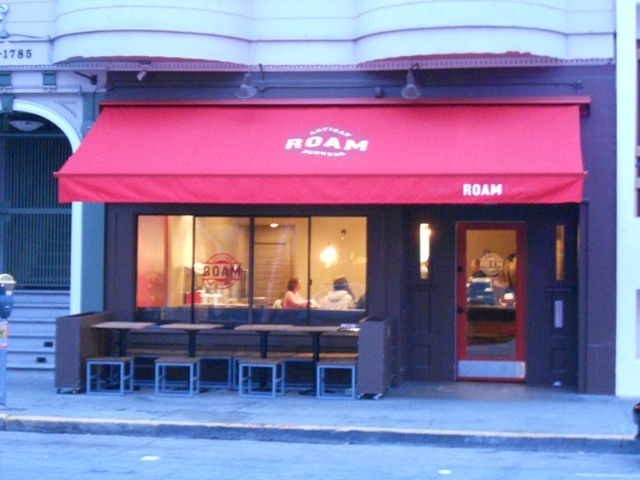 Roam Artisan Burgers located on Union Street in the trendy Cow Hollow district of San Francisco debuted last month. They call it Roam because they get their sustainable meat from farms that allow the cows, buffalo, and turkeys to roam free. Roam is a very casual environment where you order at the counter, pay for your food, get a number, and find a seat. You select a protein – beef, bison, turkey, or vegetarian and then you select one of seven styles they’ve come up with or create your own style. I was going for beef this time and I wanted to pick the most interesting style which I thought was the sunny side. 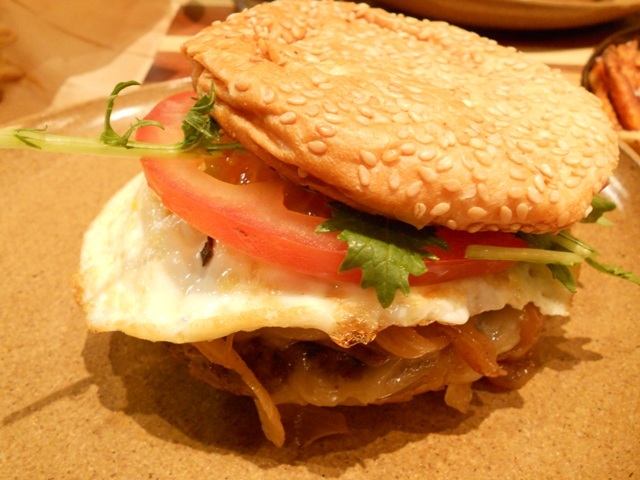 My grass fed beef burger would be topped with an organic free-range egg, aged white cheddar, carmelized onions, greens, tomato, and sweet chili sauce. I thought it was really cool that they ask you if you want it pink or not. Heck yeah! I was with my sister and another friend so I ordered the Fry-Fecta with truffle parmesan seasoning for us to share. 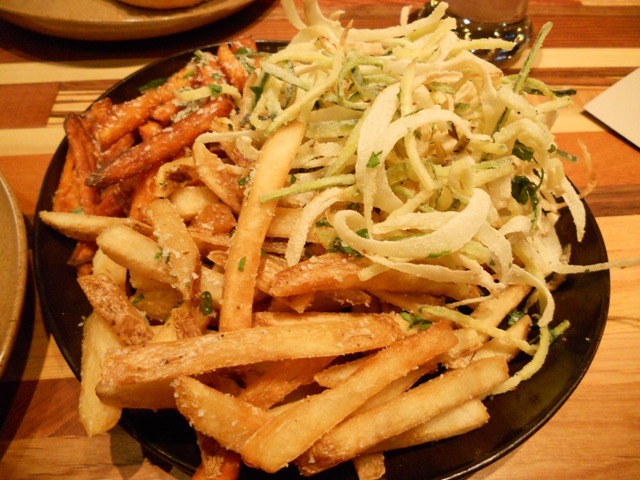 The Fry-Fecta is three sides – russet fries, sweet potato fries, and zucchini-onion hackstack. Of course, I already knew they make their shakes from Straus ice cream so the hard decision was which flavor I would choose. Again, I went for the most interesting which I thought was Blue Bottle Coffee. When she asked if I wanted a “bruleed” marshmallow on top, I thought heck yeah! My sister ordered the salted caramel shake and my friend ordered the seasonal shake which was strawberry. I tasted them both, but think my Blue Bottle Coffee Milk shake won the taste test. It won before I got to the shake, my shake won when I bit into the marshmallow that was torched on a thin crisp wafer. It was awesome! The Fry-Fecta was a nice option for the first time so we could try the various sides. The sweet potato fries were amazing and so were the zucchini onion hackstack, which I would describe as deep fried onion and zucchini shoestrings. There was nothing very interesting about the russet fries, but maybe it was because the other two options were so great. The burger itself was a quarter pound, which is actually the perfect size for me. The egg on top was cooked perfectly. I was afraid I would make a mess, but there was just enough runny egg yolk that it did not spill out. It was a good lean burger topped with plenty of goodness. My sister ordered the Chalet which has cremini mushrooms and swiss cheese. My friend ordered The Classic which comes with house-made pickles. What I appreciate the most about Roam Artisan Burger is their drive for quality in every ingredient and kudos goes to the owner Josh for making that his mission. 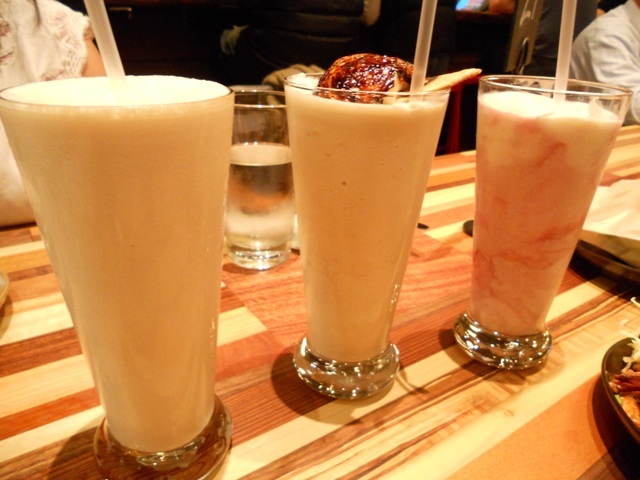 To add to my storytelling, the owner Josh came around to me and commented about the photo I took of the three milkshakes. I told him about my blog which he further inquired about. I also let Josh know that I may have spoken to him a few weeks ago on the phone before they opened. I happened to be browsing their website a few days before they were publicized to open and it said “Now Open.” It was a Saturday and probably easier to get into the City than a weekday, so I decided I was going to go out there. I thought I should call them first to double check. It was Josh that answered and he indicated that they weren’t opening until Monday. I told him about the website and he apologized and said he would contact the webmaster. He also noticed my 510 area code and commented about coming from so far away. Josh did remember speaking to me and went on to explain what had happened. After we spoke on the phone, he called his webmaster who told him he was testing the page and had the “Now Open” posted for five minutes. Well, no doubt Roam will be my first thought when I crave a burger and I hope they will be so successful that they will roam over to the East Bay someday soon. Great photos and blog post!! So glad to have you, your sister and friend in for a meal at Roam. 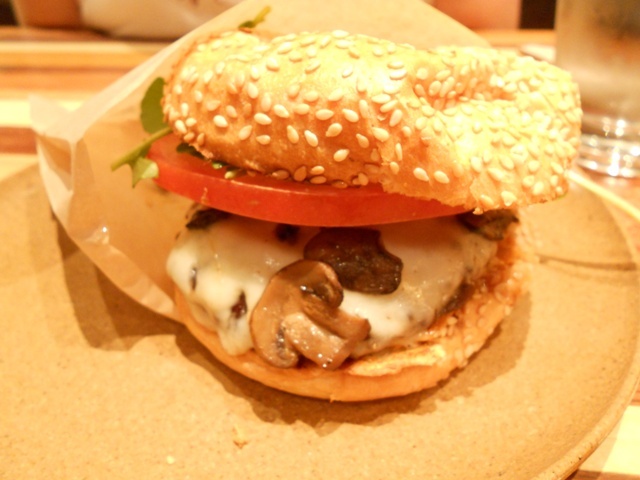 As you said, we are committed to 100% grass-fed beef, and an all around better for you burger experience. Have a great week and see you soon!! Thanks, Josh! 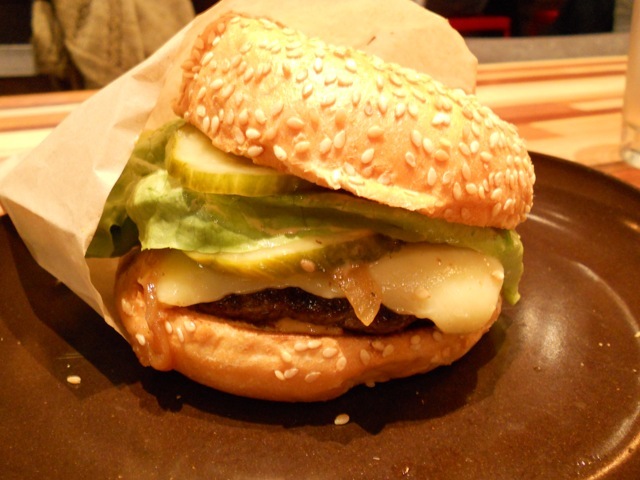 I hope to be back soon so I can try the house made organic veggie burger and the housemade soda…mmm…prickly pear!